Prevent Silverfish From Eating Your Paper Treasures | Massey Services, Inc. While bringing down and storing your holiday decorations, you may have stirred up silverfish that have taken up residence in your attic. These soft, scaly, silver-colored pests nibble on the edges of many types of paper and paper products, book bindings and wallpaper. They also eat cereals, wheat flour and starch in clothes and linens. It’s important to prevent silverfish from damaging your paper treasures and invading your favorite starchy food products. 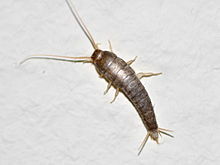 Silverfish are quite common in almost every attic, but will generally stay within dark, protected areas under the insulation and behind the walls rather than come out into an air conditioned home. After shuffling boxes stored in the attic, you may start to notice these soft, wiggly creatures inside your garage and home. Silverfish belong to what is thought to be one of the most primitive of living insect orders. They are characterized by the three long tail-like appendages arising from the tip of the abdomen, which is responsible for the group’s common name – bristletails. They have chewing mouthparts, long antennae and a body that is nearly always covered with scales. There are a variety of silverfish species, but when it comes to meals, they all have similar feeding habits. These insects will roam a distance in search of food, but once they have found a satisfactory source, they remain close to it — a good reason to prevent them from gaining access to your paper treasures. These pests are extremely resistant to starvation and may be kept alive without food and water for weeks. In an experiment performed inside a laboratory, it was found that when kept inside a glass jar, one adult out of 20 survived for 307 days without food. Silverfish tend to breed in bookcases, storage boxes and linen closets. They thrive in moist, hot areas such as attics and crawl spaces. Remove leaf debris around the exterior of your home and gutters. Box and tightly seal all papered items in storage to keep silverfish out. Keep paper items and wrappers to a minimum. Avoid bringing cardboard boxes that have been stored in the attic, garage or basement inside your home. Vacuum baseboards, especially in storage rooms, closets and laundry rooms. Make sure roof and plumbing leaks are repaired. Reduce humidity by running air conditioners, humidifiers and bathroom fans. If you have a need professional assistance with a silverfish or other pest infestation, contact Massey Services for a free inspection.